The time has come to move on to the next adventure in your life, and you’ve decided that part of that adventure is selling your current home. Choosing the right real estate agent to sell your home is critical to your peace of mind and the financial outcome of the home selling process. Your real estate agent will assist with pricing your home and be there to help you navigate your way through the transaction. This is why it’s so important to have a good relationship with a real estate agent that you can trust. How do you know which real estate agent is the right one? Here are some tips you can use when choosing a real estate agent to sell your home. When people are satisfied with a job well done, they are happy to share that information with others. Check with friends, family, and business associates for their suggestions when it comes to real estate agents in the area. Once you get the recommendations, you can do your own research for more testimonials. It’s highly suggested that you refrain from working with family and friends who may be real estate agents. While it may seem ideal at the beginning, this type of interaction could be a strain on your relationship and prove to be costly financially. Be cautious about working with a part-time real estate agent without the backing of a professional team. While they may have good intentions, they could lack the experience you need to move swiftly through the home selling process. Seek out a real estate agent who specializes in the type of home you are selling. If you’re selling waterfront property, find a real estate agent that is an expert in this area. If you are selling a luxury house, seek a real estate agent with the knowledge and experience to process a luxury sale. Your real estate agent should be an expert on the local area and know about the school districts, local businesses, recreational activities, and community events. Don’t be shy when it comes to interviewing a real estate agent to sell your home. There is a lot riding on their participation and professional skills. This is not the time to mince words or sit back and allow someone else to take the wheel. Ask questions about their recent home sales. How long is their average time on market? How often do they have to lower the price to sell? This will tell you how aggressive they are when it comes to marketing your listing. One of the most important things to connect on when seeking a real estate agent is the level of communication. Make sure their methods meet your expectations. It can be frustrating to wait for phone calls that never come or leave messages that go unanswered. If you prefer to be contacted by text, discuss that with your real estate agent. If you would rather meet face-to-face weekly, discuss that. Right from the start, establish clear expectations. When looking for a real estate agent, the old phrase that maintains — all that glitters is not gold — hits the mark. Flashy signs and big promises may catch your attention, but look beyond the surface for the substance. Watch out for real estate agents who promise you the moon when it comes to your real estate sale. Look for a real estate agent that is straight-forward and honest, even if the answer isn’t what you wish to hear. Make sure you understand how the real estate agent plans to market your house for sale. Their methods will have an impact on the success of your transaction. You’ll want them to be knowledgeable about the local real estate market and have the experience to know what works. A real estate agent who stays current with the latest technology will give you an edge. When you choose a real estate agent, you hope to pick one that understand your needs and will be with you throughout the home selling process. However, there are times when things don’t work out as planned. In this case, you need to be clear about the exit procedure with your real estate agent. Make sure your conditions are included in your contract. The last thing you want is to be locked in to an agreement that causes you stress and costs money. 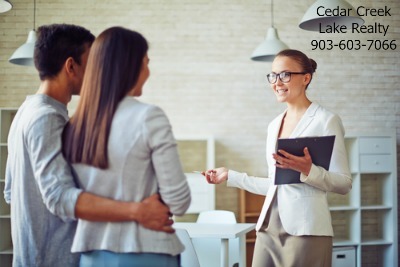 You can be sure that you’re getting personal attention from professional real estate agents with the knowledge and experience to sell your home when you call Cedar Creek Lake Realty Team. Give them a call today at 903-603-7066.